Relena and Heero have come aboard the Libra in a last-ditch hope to talk some sense into Zechs, but he will not listen. Treize and his forces arrive, and Treize challenges Zechs to a one-on-one duel to decide the fate of the war, but Zechs refuses, having cast aside such notions as "honor" and "chivalry." Now the immense ships libra and Peacmillion are on a collision course with one another, and the resulting collision could destroy all life on Earth. It's up to the Gundam pilots to put an end to the fighting in this, the final volumes of Gundam Wing! 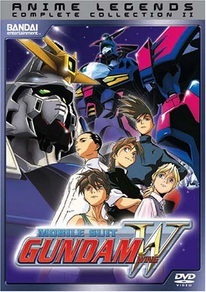 Contains the second half of the Gundam Wing TV series. DVD Features: Textless Opening, Textless Ending, Character Profile Gallery, Gundam Profile Gallery.